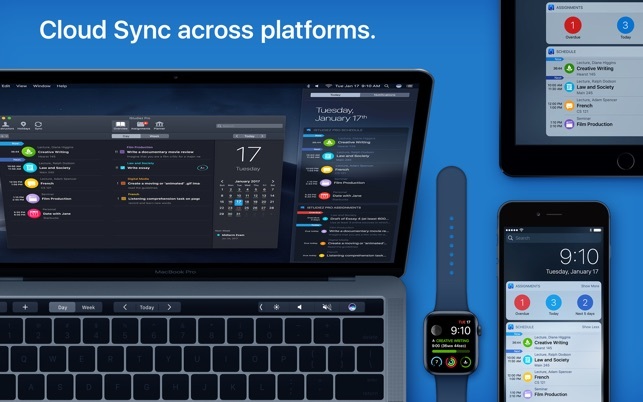 Dark Mode for iStudiez Pro now available on macOS Mojave, follows your system settings. 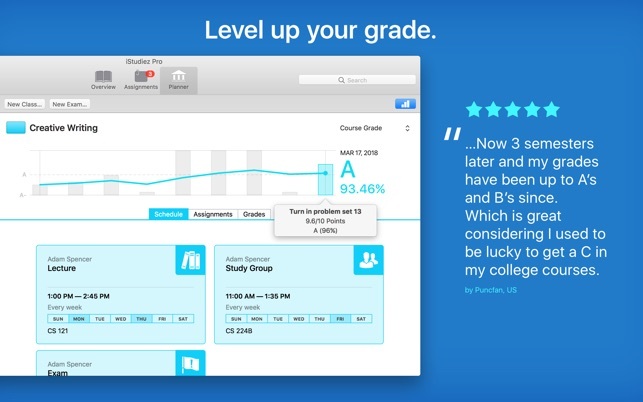 Also, hope you like the new button we added in Planner, it switches between your Grade Graph and Course Statistics. Since now everything is kept at one place. Would Reccomend to All College Students! 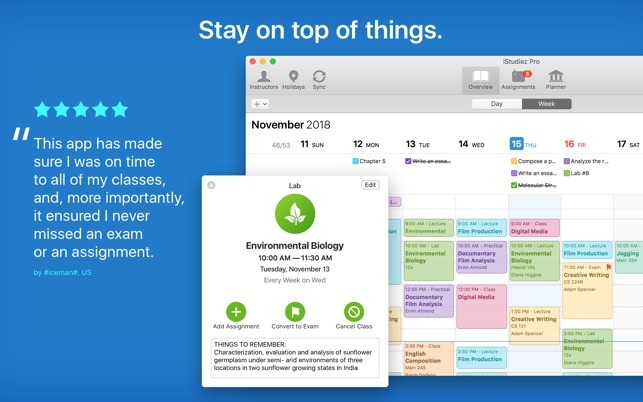 I started using this app during the spring semester of my freshman year, after struggled to keep track of all of my assignments in a hands-off college setting. I am now in my senior year, and still use it religiously, and reccomend it to all college students. I usually spend a few hours at the beginning of the semester inputting all of my asignments from the syllabus. Once I do that, it’s pretty much set for the semester, and maitenance is just checking assignments off, which is weirdly fun! This keeps me organized, helps me to see what my week will be like, and I never forget about an assignment. I also love that it calculates out your grades based on weights - very helpful when your professor and online calculators can’t do that for you. All of the functions that the app offers are easy to use, and I’ve never had any glitches or issues with it. I also love that it auto-syncs to a mobile app! I did see that another user reccommended recurring assignments, and I agree that this would save me some time when inputting things. But, I also think that the lack of this feature doesn’t detract from the overall quality of the app, especially for a one-time $10 payment! I would 100% reccomend this over a paper planner for any busy college student who likes to stay organized. It’s so much simplier, less bulky, and easier to adjust than any paper planner, and has improved my GPA and mental health! Thanks a lot for your generous feedback! The review like yours encourages us keep working on the app and continuously improve it. If you have any ideas about how the app can be improved - please let us know! Sync feature no longer broken! I’ve been using this app for the past two years straight. For the majority of the time, it has worked like a charm! It provides a streamline and clean way to organize classes, assingments, exams, holidays, and whatnot. 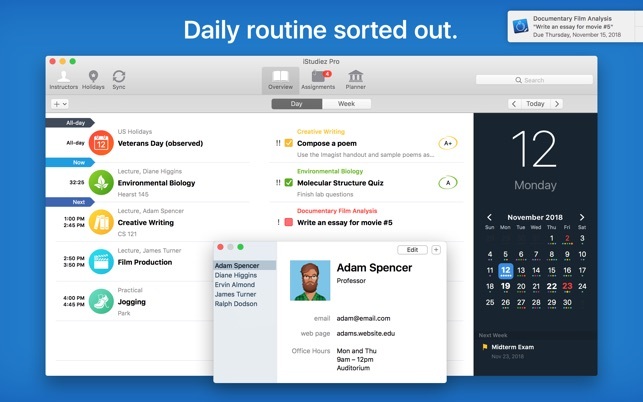 It’s the perfect tool for a student who needs to keep a tidy schedule. Only reason I’m not giving 5 stars is due to the recently broken sync feature. I use this app on both my iPhone and my MacBook and like to keep the data synced between the two. However, recently I’ve received multiple error notifications whenever I try to sync. This is rather annoying as I am not able to access my timeline that I’ve laid out from both of my devices. This wouldn’t be as big of a deal had I not paid $10 for the application on my Mac. If this issue is fixed, I would have no objection to rating 5 stars. But for now, it gets 3. Edit: No longer broken, back up to 5 stars! Thanks for the feedback! Please try to sign into your Cloud Sync account now and let us know the result. Email us to support@istudentpro.com. Thank you in advance! Hands down, this is THE best app for college! 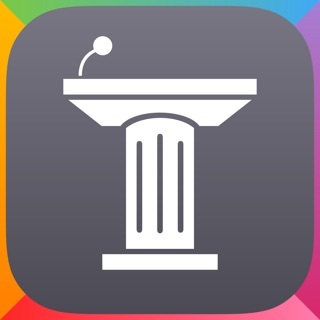 I love this app and recommend it to all of my friends! I’ve been using it for three years now and it has made my life a zillion times easier (a zillion is a number.. I promise). At the beginning of each semester, I spend a bit of time inputting all of my assignments, grade weighting, and credits for each class. It saves me so much time and energy, I always know what’s due next, and I use it to manage tasks outside of school now, too. I always know where my grades stand (my friends waste so much time trying to calculate theirs). Plus, I’ve only had issues with this app two times in the last 3 years and the customer support team are fast to reply and incredibly helpful. I have this on my laptop, phone, and iPad - it’s WELL worth the few bucks it costs and is invaluable in how much it helps you keep on track of your assignments. Get it. You won’t regret it. Thank you very much for your encouraging feedback! We are glad to know the app is so helpful to you! Wish you all the best in your studies!